“Go Ask Alice” is a supposed diary written by an anonymous 15 year old girl who finds herself on a path of self destruction and drugs. Though the front cover claims that the book is a true diary, the truth is that it was written by a woman named Beatrice Sparks. No matter who wrote it, it was still an excellent book to read. It gets four out of five stars from me. The story starts off when the main character (the anonymous teen) begins to write in her diary for the first time. This is before drugs came into the girl's life. You get a sense of her personality pre-drugs. Though it seems a bit boring, later on in the story you realize how important those beginning entries were. It helps to show the difference between the real her and her under the influence. The author did an amazing job at showing how the influence of drugs can really change a person. When the girl is sober, she seems happier and thinks with a clear head. When the girl is on drugs she’s more rebellious, doesn’t think straight, and is very irritable and angry. This book really keeps the reader engaged. The major ups and downs of the story and wondering if the girl is going to use again keeps you interested. Just when you think she’s done with the drugs they always find their way back into her life. Then she spirals out of control again. Of course, even with a book as good as this one, it still has it’s faults. First off, the title of the book makes it very confusing. The book is supposed to be by an anonymous teenage girl but the title makes the reader think that her name is Alice. If you research the book online it says that “Go Ask Alice” is a line from a song called “White Rabbit” that was popular in the 60’s and has some connection to drugs. Other sources say it’s because of the references to “Alice In Wonderland” in some of the entries. Even some descriptions and summaries online use Alice as the girl’s name, but the book is by Anonymous? Another thing that I did not like was the way it ended. Not necessarily because of what happened at the end but the way the author went about it. I felt like there was almost nothing leading up to it. The girl ends her diary on good terms. She’s clean and is getting her life together. Then the epilogue tells you what happened to her just weeks after her last entry was written. I personally wanted a bit more leading up to it. “Go Ask Alice” is a great book to read. It sends a powerful message about the dangers of trying drugs, even “just once”. One time turns into an addiction. This book is for high school students only due to its mature content and some adult language. 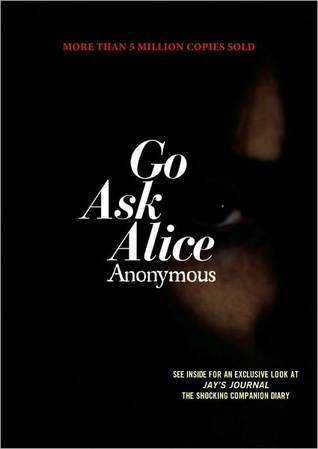 -- Daniella G.
Sign into Goodreads to see if any of your friends have read Go Ask Alice.